These and ALL materials posted and printed ARE COPYRIGHT Builders In Scale / SwitchMaster © 2003. The paper version supplied with product will be up to date. They may be copied for NON-COMMERCIAL USE only. Auxillary contacts for switching power to points, frog, and/or blocks, etc..
High quality, SPDT, fully enclosed, industrial. Rated at 3 amp. This power routing micro-switch can be used to automatically reverse a block of track power, or to power points and/or frogs with poor electrical contact. In either case, the switch machine movement is used to throw the micro-switch. 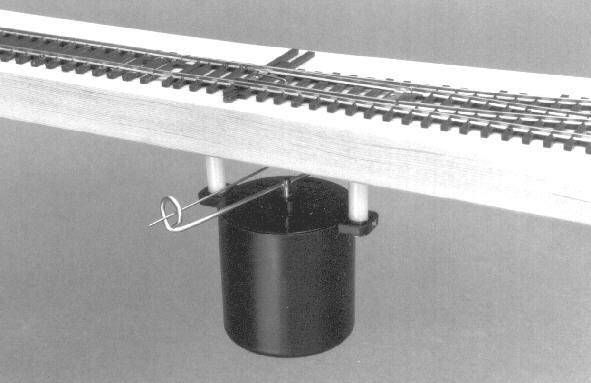 This switch attaches to the motor itself or to the underside of the layout. These are high quality, fully enclosed SPDT (on/on) contacts rated at 3 amps and built for tens of thousands of throws. Before installing the switch, let's discuss frog wiring. Depending upon which way your turnout is throw, we want the contacts to route the correct power to the frog, which is otherwise isolated. On some turnouts power is fed through the points. SwitchMasters are good for this because the apply a constant firm pressure. Auxillary contacts are needed if the points are dirty or in the case of modified "DCC-friendly" turnouts where the points have been hard-wired to the outside rails to eliminate possible shorts, leaving the frog completely isolated. Whatever the case, the frog's polarity must be the same as the track alignment. Pin 1 (nearest the hinge) is the common contact. It switches back and forth with the other two pins. Pin 2 (farthest from the hinge) is normally closed (meaning electricity will flow between it and with pin 1). And pin 3 (middle) is normally open (electricity will not flow). When the switch is activated the circuit is reversed, pin 3 opens and pin 2 closes. Okay, so let's connect pin 1 to the frog. Pin 2 goes to the outside rail of the normal route (straight or main), and pin 3 connects to the diverging route's (curved or siding) outside rail. Pretty simple. If you are experiencing a dead short most likely you need to reverse pin 2 and 3. Before installing the switch, throw the switch machine to the mainline (or "normally open" position). The power routing contact should be triggered when the turnout points are midway in their movement (this prevents a momentary short through the points). Experiment with the timing and placement of the contact (if attaching to motor, place it near the bottom of the motor at a slight angle, with the turnout in the normally open position). Once you've determined where the switch should be placed, glue it in place using ACC, hot glue, or a silicone type adhesive. After attaching the switch, if it isn't triggered at the exact moment you desire, the brass wiper wire can be slightly bent as your final adjustment. Alternately, the switch can be attached to the underside of the layout. Use the same guidelines above for determining its position. A number of power routing contacts can be "stacked" by gluing them together if multiple contacts are required. Sorry, we know the price of the assembled PR-1s is rediculas. We simply got tied of making them up for you. It takes 5-10 minutes to do one. No big deal, but we've got other things to do with our time. Really all you are doing is soldering a 1/32" brass whisker to the micro-switch actuator. Problem is it is stainless steel do the soldering is tricky. We put a little loop-back on one end and hook it onto the opening in the actuator flap. Clamp it with hemostats. This holds the wire in place and dissapates the heat. We then wrap the wire with a small strip of brass shim stock about 1/16" wide. This assures that the wire will not let go. Apply a little solder paste, heat with a soldering iron or gun, and solder. There, done. You can do that, and save a lot of money.